You send one partner one of the postcards you received for making a donation as described on this Swap-bot Blog post. 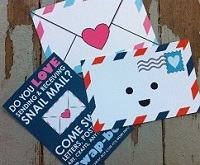 It must be one of the three pictured above - "Sealed With Love", "Ernie the Envie", or "Love Snail Mail". On the back of the postcard, please write something nice about Swap-bot, what you like about swapping, something interesting that's happened to you as a result of swapping, etc. The postcard will be sent naked - that means use a stamp and do NOT place it in an envelope. Please write the date, the swap name, and your username as well. Newbies welcome with a well filled out profile. No recent 1s or 3s; PM me if you want to chat about your rating.